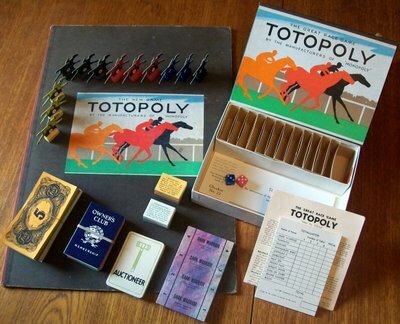 'TOTOPOLY' BOARD GAME: The idea of the game is that racehorses are leased by players and trained by them for the race. 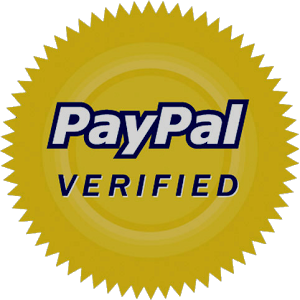 Players have the opportunity of leasing horses at first option - that is through the deal, and later the chance arises to lease additional ones in the auction sale. In the same way, players will acquire temporary ownership of a racing stable, veterinary surgeon's practice or forage merchant, etc. When all the horses and businesses have been sold, the training of the horses then commences. And when training has concluded, the race will then begin. Totopoly is arguably the most sought after vintage game of all time and we are delighted to offer a truly spectacular example this board game classic that may be advertised as unused. Notwithstanding the fact that board games of that era came in two parts - the board as a standalone component and the box housing the remaining contents - the board itself is in very good condition and shows only minor signs of storage wear; there are no rips or tears in the paper and the leaves (which open out in book-like fashion to reveal two separate courses) remain securely bound. It is, however, the excellent condition of the contents box and the contents themselves which deserve the most attention. The twelve cardboard horses (cardboard due to austerity measures following WWII) are in very good condition and show only minor signs of wear; each and every horse is complete with all limbs and rider. The remaining contents are all accounted for and in superb condition (the vast majority of the 48 betting slips remain bound together). It is rare to find this edition of Totopoly complete; but to find the contents in such excellent condition as well is almost unheard of. Certainly this game would be an outstanding addition to any vintage collection.